Imagine for a moment a vast underground rail network that stretches as far as Melbourne’s suburban fringes. Trains arrive and depart every five to ten minutes, a station entrance is never further than a 15-minute walk away, and you don’t need to catch a train into the CBD and out again to travel between east and west, or north and south. Trams are separated from road traffic. Cyclists are separated too, by reorganising lanes so parking spaces and bike lanes switch sides. That’s the dream, right? There have been many dreams for Melbourne since European occupation. Plans for an immense extension to the grid of streets making up the CBD, a significant expansion of railways, and daily jet-car commutes were just some of ideas past planners presented to feed our imaginations. Looking back at Melbourne’s planning history, we might be able to find some inspiration to deal with rapid growth by thinking outside the box. The Melbourne CBD square bordered by Flinders Street, Spring Street, La Trobe Street and Spencer Street is known as the Hoddle Grid. This grid was laid out when there were fewer than 200 settlers, but is now the centre for a city of nearly five million people. Numerous proposals in the late 19th century aimed to extend the Hoddle Grid. These often focused on repurposing the West Melbourne swamp (a large saltwater lagoon to the immediate west of the city which was fully drained in 1890) to join the Yarra River to accommodate a network of shipping canals. Engineer John Millar proposed, in 1860, to extend the grid westward into Port Melbourne (then called Sandridge). Most famously this proposal is remembered for Millar’s idea to redevelop the swamp (which had already been partially drained) into a botanical garden to resemble the British Isles. The intention was to preserve and cultivate plants native to England, Scotland and Ireland. He made provisions for large ships to have docking areas, and for parks, gardens and ornamental grounds. This plan was lost in the flux of the times. Had it been realised, it would have drastically reshaped the young city and provided a still lacking interconnectedness with the western parts of the inner city. An 1875 proposal for a shipping canal and docks west of the Hoddle Grid set out to achieve a similar outcome. A large canal would have cut past Sandridge to the west across the Yarra River, where a smaller canal would have connected the Moonee Ponds Creek near present-day South Kensington railway station. A familiar grid pattern would have filled the area, complete with intersecting railways. 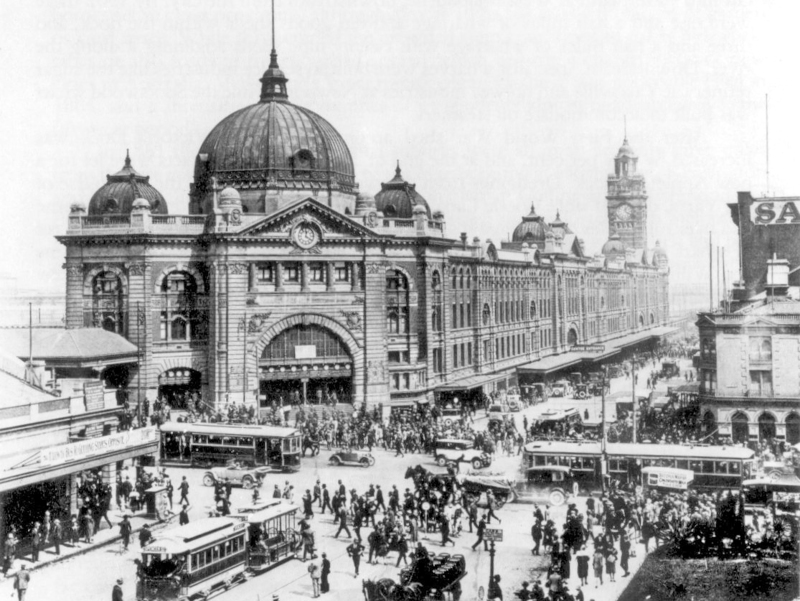 Melbourne’s railways have been imagined and re-imagined many times over since the first train departed in 1854. Observed to resemble a hand, the suburban lines all converge at the CBD. Throughout the 1900s, the Tramways Board was responsible for Melbourne’s tram network. In the 1920s, the board proposed a significant expansion of the suburban tram network. One of the proposals was to introduce services across Bell Street, Moreland Road and Dawson Streets in the northern suburbs to not only have radial routes (which converge in the city) but also allow orbital routes (which can intersect radial lines, without having to go into the city and back out again). Throughout the 1920s the then Metropolitan Town Planning Commission compiled the Plan for General Development, which identified urgent works and improvements to correct haphazard land boom development. One such proposal was the northern city underground to connect the Jolimont rail yards to North Melbourne railway station beneath Victoria Parade. This was intended to distribute pedestrian traffic between Flinders Street, Prince’s Bridge and the new northern stations, as well as reduce walking times to stations from 15 minutes in some areas to within five and ten minutes anywhere in the grid. This scheme was abandoned partially due to the onset of the Great Depression. Everybody involved in the planning process should spare a thought for yesterday’s Melbournes of tomorrow. Like those before us, we are yet to tackle one of the biggest challenges of getting many people places quickly. We should continue questioning our dependence on motorcars, which are neither practical nor efficient for achieving the 30-minute city. If we can seriously consider orbital railways that can move people across suburbs without having to go into the city, we can prevent unnecessary congestion in the CBD. Read more: 'The 30-minute city': how do we put the political rhetoric into practice? Planners should continue to encourage walking and cycling (which includes making the streets safe), while also separating trams from other forms of traffic. This would attract more people to public transport, leaving the roads for those who truly need them. Together with the government’s focus on mass transit, Melbourne Mayor Sally Kapp’s provocative proposal to reduce road congestion in the CBD – by making some streets one-way and giving priority to pedestrians – is a step in the right direction. Imagination is an important part of the planning and design process as it allows us to see infinite potential in the urban environment. Unfortunately, these dreams are often dismissed early due to increasing sensitivity to economic feasibility and immediate return on investment. While budgets are important, we must remember that planning and design should be about improving the lives of the people in our cities and towns, even if projects come at a higher cost and take longer to deliver.